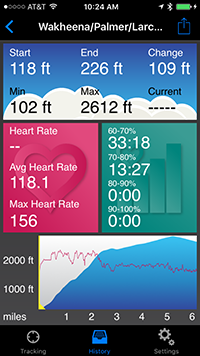 You can view these statistics for a portion of your route by dragging the range selectors across the profile. 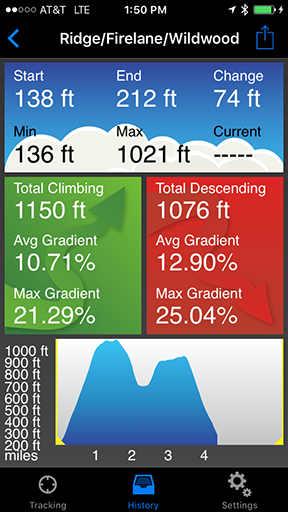 For example, you can check the elevation gain for one particular climb or compare your average speed on different climbs. 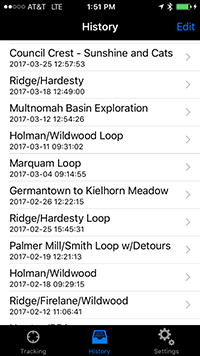 When you're done, you can save the route for review later; email a summary and profile image to a friend or post it on Facebook; or send your GPS data in GPX format to a website like Ride with GPS. 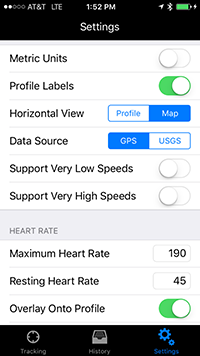 The app works in the background or with your device locked, and can run alongside other GPS apps, so you can generate elevation profiles with this app while doing other kinds of tracking with another app. And it can display key info on an Apple Watch or Pebble smart watch for quick access during your activities. Install it today and give it a try!